Rock Falls, IL, August 6, 2012 – IFH Group’s Fluid Storage & Dispensing Systems offer an optional Spill Containment Systems that prevent costly and time-consuming clean-ups, make fluid dispensing easier, and keep the systems in compliance with EPA regulations such as 40 CFR 264.175. IFH originated centralized, streamlined multi-container fluid storage and dispensing systems and mobile lubrication carts 40 years ago as an alternative to 55-gallon drums for handling oils, lubricants and various other industrial fluids. All of the 21 IFH standard centralized systems are equipped with a Drip Pan, making dispensing of fluids into containers from self-closing faucets quick, easy and spill-free. 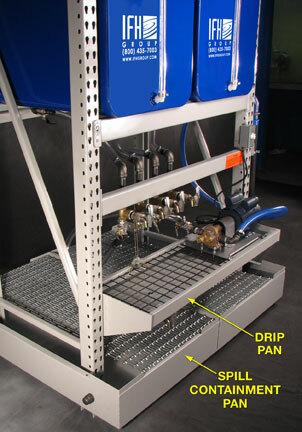 For all 2-, 3- and 4-container systems with outboard console mounting, a Spill Containment Pan is also available at the base of the system that will collect any and all accidental spills. The Spill Containment Pans are available on new models and as retrofits on existing in-the-field units.